We have been keeping in touch with the State of Alaska regarding the new eWIC program and wanted to give you a quick update. Retailers will be certified in the few weeks leading up to the clinic’s roll out. It is IMPORTANT to note that participants from the pilot area will not be able to use their eWIC cards outside of the pilot region until other areas roll out. However, stores will be capable of accepting checks all the way through 2019 when eWIC will be completed statewide for all participants. 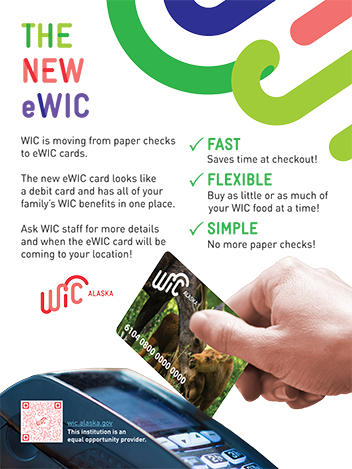 If you have questions about your point of sale system and the ability to accept eWIC cards, please give us a call at 907-243-2683.